I never knew you….You passed away when your daughter, my mother, was 16 years old…. Your daughter…my mother…was strong…..she still is…. when I fell to my knees….when my dad died…she was strong….I was not. She made it through her teen years….she sought advice and help from your sister. I never knew you….but I know your name….a beautiful name….. I want to thank you….for giving birth to my mom….Michiko. And, I want to thank you for appearing in my mom’s dream. You appeared on that white elephant…. and told your daughter to meet that handsome young American G.I. . . .
who asked you to meet him at the bridge……. the bridge where she met my dad. Where he told her to please come back tomorrow after work. You know your daughter was very hesitant….she wasn’t going to meet him…. but you knew her destiny. and Grandma…I also thank you for making me a want to be a wonderful Grandma myself. to crawl in your lap and hear tales of the wonderful folklore of Japan. But then again…I learned how to be the best Grandma…from your daughter…my mother. and taught him many wonderful lessons of life. I thank you…for making me want to make beautiful memories with my granddaughter. And in turn, she will tell tales of me to her daughter or son…. of how she knew her Grandma. So, I wish you a very Happy Mother’s Day Grandma!! As I did not have the opportunity to tell you in person….but I know you can hear me . .
every day….alongside my dad….the “love” that you chose for your daughter…. in her dream…..of you on that WHITE ELEPHANT. But most of all….HAPPY MOTHER’S DAY TO MY MOM…the strength and rock of our family. I will end this post with a saying that I use every day…something my mom says every day!! It’s is a great day….as I woke up and saw the sun!!!! HAPPY MOTHER’S DAY TO ALL OF YOU MOM’S OUT THERE!!! What a beautiful story! And a pretty family photo! Happy Mother’s Day to you too! What a sweet sweet post. I am trying to be a good grammy, too. I hate to say it, but my mom was not much of a grandmother at all to my kids or my brother and sister’s kids. I guess she just doesn’t have that gene. I am not going to be like she was. Happy Mother’s Day to you, too. What a very lovely tribute, Shirley, to your grandma. Memories and the people included in them are so special and need to be passed to our own children and grandchildren, maybe even on Mother’s Day! Oh, Shirley, this post made me cry. It is so well written, and is so beautiful the way you express yourself. Mom is going to love this so much. I loved looking at the old pics of the family. It really is a beautiful tribute to your Mother and whole family. Happy Mother’s, and Grandmother’s Day to you this coming weekend. Oh, Shirley, this tribute was so beautifully written. You have a writing talent beyond compare! Mom is going to love seeing this. The pictures of the family are beautiful. It’s really a great tribute to the whole family. Happy Mother’s and Grandmother’s Day to you. Such a special lady, you are! Oh Shirley you’ve done me in! I’ve been thinking about my own grandmother a lot lately! Especially since Cinco De Mayo! I think she would have been thrilled that i cooked Mexican food for all of my freinds! I know that our grandmothers must be looking down giving us two thumbs up! What a wonderful story! I didn’t know you were half japanese! I know they have rich family traditions, so I’m sure you have a very close family. My grandparents have all passed away too. I’m lucky that my mom is still alive though. She is 79. Getting up there! This is really very sweet, Shirley. And SO heartfelt!!! Your Grandma is undoubtedly looking down from heaven and smiling on you right now. I never knew my maternal Grandmother, either (she died when my Mom was just 4), and I often wonder what it would have been like had she been in my life. 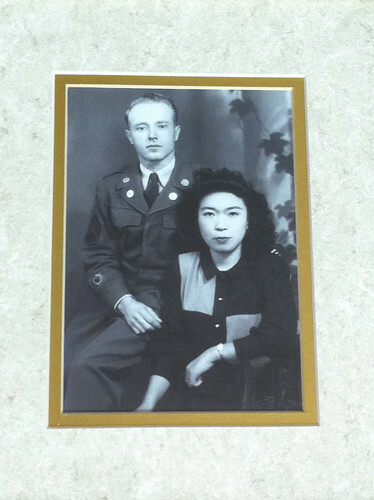 I had a wonderful step-Grandmother who I loved with all my heart, but still…I wonder. Beautiful post! This is a very loving tribute to your grandmother and mother. I hope you and your mother have a wonderful Mother’s Day. 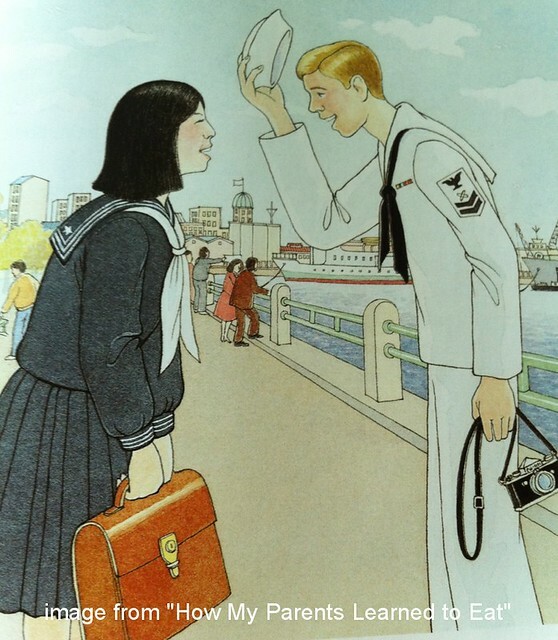 I loved the drawing of the soldier and the Japanese young woman. I wonder if your parents were the models! 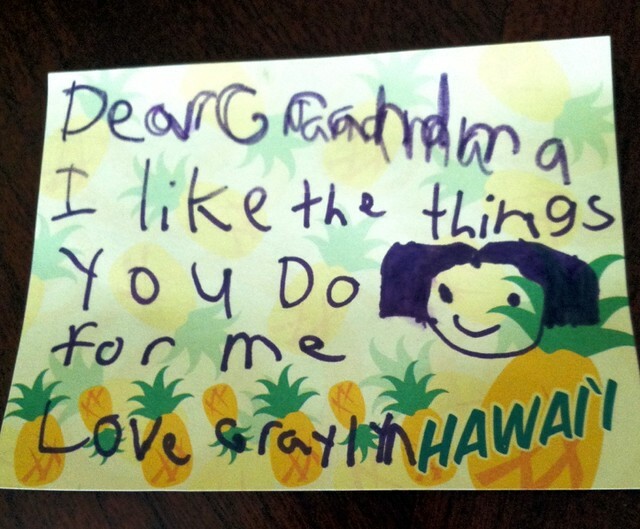 Such a beautifully written heartfelt open letter to your Grandma! It brought tears to my eyes. I have been missing my grandmother lately. Amazing tribute to your mom as well! So very sweet! p.s. I am following you now. p.p.s. My son was adopted from Japan, and we plan to one day take him back there to visit. We loved our time there, and we are happily teaching him about the wonderful culture of the country of his birth. Shirley, It is a beautiful tribute to your grandmother and mother. Both of my grandmothers passed many years ago but I still miss them every day. So sweet, Shirley! What a wonderful way to honor your mother and grandmother. Happy Mother’s Day to you dear friend! Shirley, WOW! 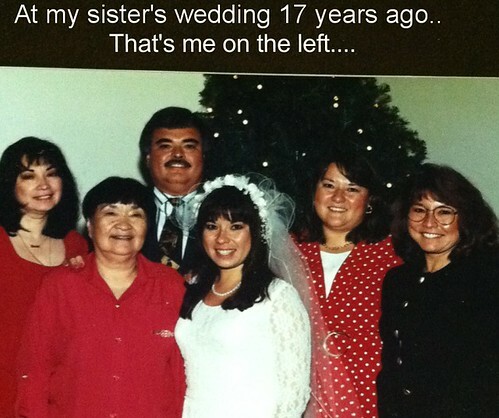 What a sincerely heartfelt way to honor our mom with this post. Isn’t it incredible how the story Carol sent us parallels Mom and Dad? 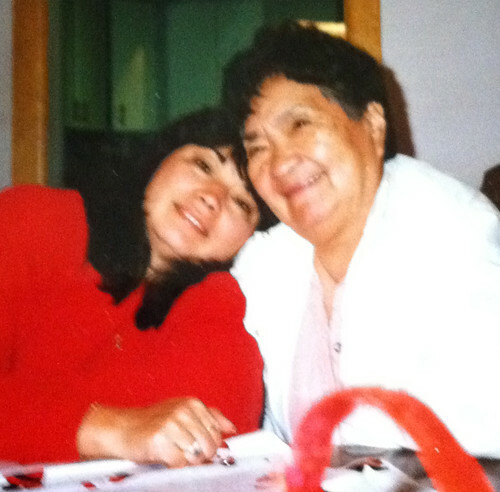 Although we were never fortunate to know firsthand the kindness and love of our grandmother, we can only imagine how dear she must have been to have raised such an amazing woman….our mom. Through Mom’s inspiration, encouragement, and wisdom we have become the women we are, and I am so very proud as I watch my sisters be the greatest mothers, grandmothers, and friends. Thanks so much for sharing with others and reminding me how blessed I am to part of our special family who has a one in a “gazillion” mom at the center, who has always been the glue that holds us so tightly together…. What a wonderful, wonderful, wonderful post. I love your heart so much and this is a tribute to the incredible woman who helped to make you what you are today. Thank you for blessing me today. This is a lovely tribute…so touching. I love stories like these, sharing family and memories. Thank you for sharing your heart and your mother and Grandmother. Happy Mother’s Day. Shirley, This is so beautiful. Thank you so much for introducing us to your grandmother. You are so lucky to have such a close family – I’m sure your grandmother would be very proud! And of course, you’re the world’s best grandma yourself! Such a beautiful post and sweet way to honor your grandma. Okay I HAD to come over here and read about the dream. That is amazing really!! A dream that forged your mom’s destiny and yours. What a story!! Pinky’s recent post…Just to let you know…. Come visit as I share sophistication on a budget. Simple tweaks make a world of difference in my home. With just a little TLC, yesterday’s vintage discoveries become today’s treasures.